Living in Orlando offers tremendous opportunities this Advent Season. With St. Andrews’ Chapel close by, we usually attend their Ligonier Ministries Advent Service. It is a glorious time to see old friends and hear R.C. Sproul deliver a powerful message. This year however, R.C. did something that he rarely does. He preached for 45 minutes and entered into new sermon territory. When you have written over 45 books and produced numerous videos in so many subjects, it is rare to hear R.C. preach on something you have not heard before (especially if you live here in Orlando). There is debate as to the punctuation of this passage. The nature of the question has to do with the comma between wonderful and counselor, so that the term wonderful is an adjectival qualifier. Further evidence of this is that the rest of the names appears in couplets, but that does not necessarily mean that we should put wonderful and counselor together. The majority report in church history is that they are two distinct names. The one born in Bethlehem is called Wonderful. According to Sproul we ought to see this section of adjectives as two distinct attributes. He is wonderful and counselor, not as the ESV translates it: Wonderful Counselor. With this context in mind, Dr. Sproul borrows the entirety of the sermon from one of the new published Puritan books by Jeremiah Burroughs entitled: Gospel Revelation. In this book R.C.’s favorite Puritan preaches several messages. Among them Burroughs preaches on why the name of God is the only One worthy to be praised (Psalm 148:13), and on another sermon he exegetes that one small phrase in Isaiah 9. The central theme of the sermon is that we have the tendency to restrict our praise of God to His works and gifts. Though this is good, nothing satisfies the soul more than to praise God for Who He is. He is wonderful. Burroughs develops the theme of wonder throughout the Scriptures. He focuses on the wonder of the Word made flesh, the wonder of the offices of Christ (Prophet, Priest, and King) and the wonder of Christ’s miracles. It was truly a delightful treatment of a word generally untreated in this Advent Season. It became evident throughout the exposition that the idea of Christ as wonderful is found in all of Scriptures. Christ is indeed the wonder of this Season. We rejoice in this Advent season because our faith is renewed and strengthened. There is nothing we desire more in this season than that “our souls may be moved to doxology” in light of the wonder of Christ the Lord. As we come to the end of this year, I would like to spend the last few weeks making some comments on the relationship between the Advent and our faith. The Season of Advent is a glorious time for those who follow the church calendar. Advent offers for Orthodox Christians a time of anticipation and hope. 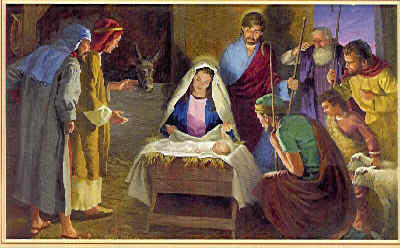 Our anticipation is not in a mythical event, but rather in the glorious coming of our Lord in history. He dressed himself in human flesh and served us until death. Advent, then, centers on Christ’s coming and anticipates His coming again. This is why the primary color in our sanctuaries is purple. Though purple has been used for fasting and penitence, it makes better sense to understand it as the color of royalty as we welcome the “Coming” or “Arrival” of our great King. In this time of the year, we join the apostolic voice. We are united to that one body that sings and rejoices in the Savior/Messiah. There are times of the year where we ought to fast and repent of our failures and our unworthiness to follow our King, but Advent is not that time. Instead, nothing in this season leads us to weep, but everything leads us to rejoice. If the King had not come, we would weep; but thanks be to God we rejoice, for Emmanuel has come to thee, O Israel. Galatians 4:4-5 But when the time had fully come, God sent his Son, born of a woman, born under the law, to redeem those under the law, that we might receive the full rights of sons. 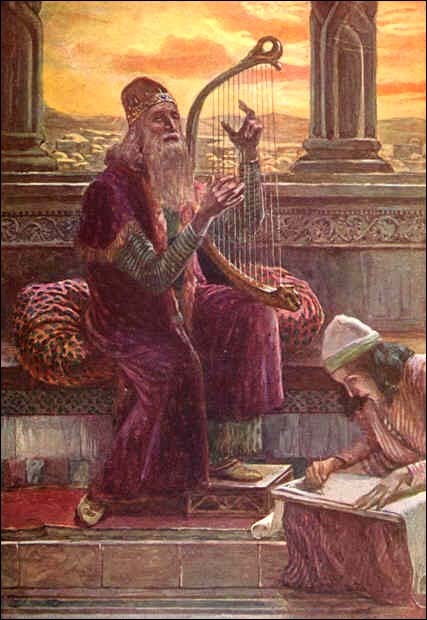 Music has always enhanced worship. In fact, it is hard for anyone even to fathom what worshiping is without music. Music by its very nature is sacramental. It replenishes weary humanity with a touch of peace and sanity. Music calms the waves and changes the heart. But beyond and above all, music is prayer. It is spoken prayer. It is audible utterances of joy and terror. When fearful, music expresses what we cannot. When jubilant, music expresses what we cannot. The most miserable of all voices finds pleasure in music because though one cannot sing as eloquently, sounds crystallize what one feels. It makes of him a solitary choir with God in his audience. Music is art; it is worshipful art. It takes on shapes and various forms. It combines harmony with melody; melody with harmony. All come together to form one sole voice of praise. Cursed is the one who finds little value in music. But blessed is he who walks in the tune of the Lord. Augustine writes, “Qui cantat, bis orat.” Fellow Christian, to sing once is to pray twice. Those who insist that the church should sing Biblical Psalms exclusively need to consider more carefully the apostle’s words in Colossians 3:16 and Ephesians 5:18-20. It is the wisdom that is the enduement of the Spirit-filled church, taught by the Word of Christ, that enables to admonish and teach one another; they do so in psalms, hymns, and spiritual songs. Paul’s expression shows that he is thinking of the wisdom that composes psalms, and therefore not of the psalms of David. Nor do his words refer to inspired compositions exclusively. The context of his use of spiritual wisdom in Colossians 1:19, his prayers for wisdom, and his charge to walk in wisdom show that he thinks of the wisdom of the Spirit as the daily need of every Christian, not a gift of revelation to bring the Word of Christ (136). Clowney finds the theme of this passage “wisdom,” not a prescribed form of worship. Granted, Psalm singing is edifying and needful; the church today lacks a catechized youth because the Scriptures are not sung nor are they brought to memorization. Surely the singing of God’s Word facilitates immensely this process. Nevertheless, there is a fundamental concern that must be addressed. Exclusive Psalm-singers argue that only Scriptures can carry the intensity and loveliness of worship. Since it is the only writing in which there can be found no error and since it claims self-authentication, ergo, it is the only prescribed form of worship. Any singing that is non-scriptural runs the serious risk of raising voices to a fallible and erroneous composition. This logic urges worshipers to consider their sinful natures and their conspicuous tendency to err. This is a critique worth considering and must come to the attention of the composer and the worshiper as he lifts his voice to glorify his Maker. …to prohibit congregational singing of anything but the Old Testament psalms is an unwarranted addition to the word of God (cf. Deut.4:2) and – ironically – a violation of the regulative principle of worship thereby. The crucial question is this: Where in Scripture does God restrict His people to singing only the songs in the book of Psalms? No such restriction can be demonstrated. Those who try to infer it end up relying on fallacious arguments. Those who insist that we must positively demonstrate that anything we sing has the explicit warrant of Scripture have misunderstood and misapplied the “regulative principle” – on a par with somebody who would hold that the very words of our prayers and sermons must have the explicit warrant of Scripture. Bahnsen’ s main argument rests on the fact that if we are to follow the logic of Psalm-singers who claim to be adherents of the “Regulative Principle,” we must further apply this to all of worship. This means we must carefully commit all our prayers to reflect word-for-word or thought-for-thought the prayers found throughout Scriptures. In conclusion, though exclusive Psalm singing is wrong, Psalm singers exemplify, if perhaps a bit extreme, the sincere urge to commit our minds and our voices to the worship of our God in words that lift, adore, praise, magnify, and reflect the grandeur of our Great God. May all of us be ever mindful of the duty of worshipping God in beauty and authentic spirit-led adoration. In continuing this short series on liturgy, I am reminded of an article I read several years ago in college that relates to this topic. The article dealt with the growing attraction of traditional churches to the younger population here in America. The essence of the article compared the normal weekly routine of teenagers. The study sought to prove why Christian and non-Christian teenagers are becoming more enamored with Traditional Liturgical Services than the rather common contemporary styles of the day. Its conclusion was that popular culture is so overwhelmed with technology every second of the day that when Sunday comes along, it is almost as if they need a mental break and enter into another world. This is by no means a critique of contemporary forms of worship. I find them valuable in particular contexts outside of the Lord’s Day Worship. However, it is my conviction that liturgy (that is, in its historical format) is a haven of rest for those who seek peace from the hectic and at times chaotic existence. Further, liturgy transforms the heart from mere individualism to contemplation of heavenly communion. By this I mean the splendor and glorious vision of a heavenly kingdom where God’s people in unison rejoice in the Lordship of our God. Liturgy also rejoins our modern (or post-modern) minds to the history of the church. This connection with history can be a fulfilling experience. This experience takes us back to the early church where the Psalms were sung. It takes us back to the great sermons of the Reformers. It takes us to the great Catechisms such as the Westminster and Heidelberg Catechisms. It takes us back to the prayer the Lord taught His disciples to pray. Iit takes us to the Creeds that have united Christendom for over a millennium, and it brings our finite expressions to the great declarations of praise to our God. This list in no way encompasses the greatness of the liturgical practices of the Church, but it certainly draws together a multitude of saints which no man can number. For further discussion on liturgy and spirituality see my article entitled: On Developing a Spiritual Pattern. In the last five months I have considered the purpose of liturgy. Michael Horton a few years ago wrote an article defending liturgy. In particular, he was defending Reformed liturgy. In our day, it appears people have completely misunderstood the purpose of liturgy. To some it is a left-over from Roman Catholicism which the Reformers did not abandon; to others it is equated with formalism or even dead worship. The truth is that everyone and every church has a liturgy; but liturgies differ in nature. The very concept of a liturgy may cause fear in some. The purpose of Biblical liturgy is to enhance worship, honor God, prepare the people for Word and Sacrament, and enable the gospel to be presented over and over in a splendid blend of confessions, affirmations, prayers and doxology. In a time when discipline is pushed aside due to pragmatism, spiritual theology is pushed aside due to evangelical lethargy. It is a daunting task to set spiritual goals when they may be in a near future altered by our schedules, children, and completing the list, we have our fallenness, which only directs our circumstances away from spirituality. The Christian life is less than appealing when we consider that the usual outcome of spirituality may be the ever powerful attack of evil forces (Satan) on the godly. Similar to Lewis’ works on spirituality, the Evil One never ceases to attack the godly. It appears that the better prepared a Christian is to face temptations, the more intense is the bombardment. On the other hand, Spiritual Theology by Simon Chan has significantly helped me to wrestle with these tensions. Digesting this work has encouraged me with a list of viable options to enhance my experience and to harmonize the struggles with the exhilarating moments of joy in my Christian life. It is my desire to pursue goals that are realistic rather than forceful. Chan writes similarly when he speaks of those who in the beginning found contentment with their new goals, but with time found them to be overwhelming and abandoned the practice altogether. Another difficulty in establishing a rule of life is that as Chan puts it, “embracing the rule of life means allowing our lives to be reconstituted by this new pattern” (pg.150). There are severe implications to a new pattern of living. Nevertheless, embracing a simple life is an art by which with proper exercising life will resemble more and more the image of Christ. In thinking about these profound issues I have sought aid in the idea of submission to Christ. In submission there is comfort in knowing that my errors in this process will only lead me to depend even more on Christ. I. A period of heart preparation seems necessary. This I call the “cleansing process” which I liken to the washings of the priests before they entered the tabernacle. IV. Then, a time of prayer which would follow common liturgy. A) Praise/Adoration, B) Thanksgiving, C) Petition, D) Praying for consistency in my devotional life. This is entitled: “Holy Conversation.” This is a genuine interaction with God. V. Finally, singing should be the “Response of Gratitude.” This could be a hymn or a Psalm that expresses my present sentiments. It may be about an attribute of God or the regular Christian experience. This seems to be an attainable pattern of life. It should take approximately 20-25 minutes. By God’s grace with proficiency it may increase. In time I pray it may become as natural as my academic pursuits or my daily interactions with my wife. This is the most profound and substantial foundation for my new rule (pattern) of life. Therefore, it seems only logical that all other forms of spiritualities should be a compliment to this rather than an additional exercise. For example, one way of implementing another idea to this foundation is found in the common theological area of general revelation. Perhaps my devotional time would be enhanced in content if it were done in the context of nature. Whether in the woods or near a lake (which I have access) or on a location where my eyes could visibly engage the mountains and valleys. All these experiences will accentuate and heighten the spiritual capacity to adorn my soul with God’s aroma and presence. A final observation regards the remainder activities of the day. It is a fact that when the business of my academic life begins I quickly lose sight or even forget the experience I have had. One way to eliminate this difficulty is to reserve the spiritual devotion to the end of the day. However, this does not seem like a possible alternative since I function better in the early part of the day. In order to help in this dilemma I have proposed a few ideas used primarily by early saints. These ideas will solidify Paul’s command to pray without ceasing. Chan calls these “ejaculatory prayers.” These are prayers that can be uttered or consciously thought about throughout the day. To make this practice vivid I have committed to read and memorize certain portions of the Book of Common Prayer which I have found to be an invaluable treasure. It is my prayer that this new rule of life may be light rather a legalistic burden. I have hope that in God’s grace He may find mercy on me, a sinner, and permit me to enjoy the richness of the Christian faith.